The DJ School is based at the Urban Arts Centre In North Staffordshire and welcomes participants of all ages and all skills and attainments. 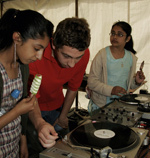 From complete beginners and novices to those who are more familiar with DJ-ing and MC-ing, and through workshops, lessons, tutorials and ongoing support and guidance encourages students to aspire to intermediate and advanced levels. Those who commit and gain advanced skills, are provided opportunities to gain a recognised qualification, to perform in public at showcases and professional events in the community at clubs and entertainment venues throughout the country, or and to launch a career in the entertainments industry. In our adult program we also teach creative and performing arts classes for those who already have a talent and would like to learn how to grow it into a small business. All our tutors are fully trained and practicing freelance artists themselves, so we have a wealth of experience to offer. You can find out more about our current adult program 'E.A.T. ', in the 'Wot's Happening' section. or become a fan on Facebook!